As was said earlier, the longest time for needle retention is 14,4 minutes. I will remind you that it happens because Qi flows from the foot source points of yin meridians to the hand lo points of yin meridians during one full yin period of 28,8 minutes. After this it will enter yang meridian. During this yin period yin increases during 14,4 minutes, receiving it's Qi from yang meridians and flowing from the foot to the middle of the body. During the next 14,4 minutes yin decreases, transforming some Qi and sending it to yang meridians and flowing from the middle of the body to the hand. These 14,4 minutes are known in Chinese medicine as ke 刻. There are two ke 刻 in each yin and yang period, so while we work with needles on the leg during the first ke 刻, we can't work with them during the second ke 刻 when Qi moved from the place and is more active in the upper part of the body. Same happen during the yang period when Qi moves from the hand down to the foot. We can observe yin-yang cycles during cun kou activity and ke 刻 cycles during chi cun activity using acupuncture pulse diagnosis. To make full body circulation through the yin and yang meridians Qi needs 28,8 + 28,8 = 57,6 minutes, qi makes 25 of these cycles every 24 hours. During these 24 hours each person, according to the first difficulty of Nanjing, does 13500 breaths. 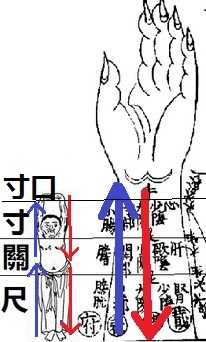 As it was said earlier, breath is not pulmonary breathing cycle but the cyclical pulse changes happening between chi 尺 and cun kou 寸口 place upwards and between cun kou 寸口 and chi 尺 place downwards as inhalation and exhalation. So each breath is 24x60x60sec/13500 breaths= 6,4 seconds. Breath as 1 yin or 1 yang period or 1 ke 刻 are constant and we can observe that through acupuncture pulse diagnosis. Does it mean that one breath is the minimum time for needle retention? Despite one breath is minimal yin-yang cycle happening in the area of 3 cun during which pulsation moves distance of 6 cun, upwards and downwards, it is not the sufficient minimal time for needle retention. As full yin-yang cycle is 28,8 + 28,8 = 57,6 minutes, minimum yin-yang cycle of breath is 6,4 seconds x 9 breaths = 57,6 seconds, almost one minute during which nine breaths occur, same time proportion as full yin-yang cycle.